Once you’ve gotten used to climbing and safety techniques in an indoor rock climbing facility, you may be itching to try your skills outside in the real world. Even if you think you need more practice before you’re ready to tackle whatever nature has in store, there are plenty of established outdoor courses for both daring beginners and intermediates. Climbing in East Asia has a lot of perks. Some of the world’s best climbing sites can be found there, along with tons of possibilities for intermediate climbers. Aside from incredible climbs, you’ll also get to know a new culture and witness some of the world’s most spectacular views from way up on the rocks. The U.S. grading system for rock climbing starts at 5.1, which is the easiest and increases up to 5.15. Beginning at 5.10 the grading is further subdivided into a, b, c or d, with 5.15d being the most difficult. While indoor rock climbing makes it easy to gage a course’s difficulty, rating natural outdoor climbs can be a bit more subjective. However, anywhere from 5.5 to 5.9 could be considered an intermediate climb. Yangshuo is a county located in southern China’s Guangxi region, and home to a little over 300,000 people. Characterized by a mountainous terrain and limestone, this area of China is world renowned for its endless climbing opportunities. With hundreds of routes to choose from, it the perfect spot for intermediates. An area called the Wine Bottle may be the best place for intermediates, which features climbs ranging between 5.6 and 5.11. This cliff is easy to access, and will offer various opportunities to practice and develop technical skills. If you’re thinking about going, make sure to go during fall, which begins in late September. This has a dual advantage: you’ll be able to attend the Yangshuo Climbing Festival held every October or November while avoiding the spring monsoons and chilly winters. Although officially a part of China, Hong Kong has a high degree of autonomy and unique economic system. With a highly concentrated population of over 7 billion, you might not except to find too many rock climbing opportunities. Yet, the territory is made up of several islands and nature parks, which also happen to have quite a few quality climbing routes. While all of the islands contain a variety of climbing routes, some of the best intermediate climbing can be found on the mainland in Kowloon. Here you’ll find several climbing spots, but Devil’s Peak has the widest variety of climbs, with the majority of the routes at 5.9 or 5.10, the perfect challenge for intermediate climbers. From the top of the peak you can view the surrounding bay and parts of the city. Famous for its modernity and futuristic architecture, when you think of Seoul you probably don’t think of rock climbing. But there’s more than meets the eye. 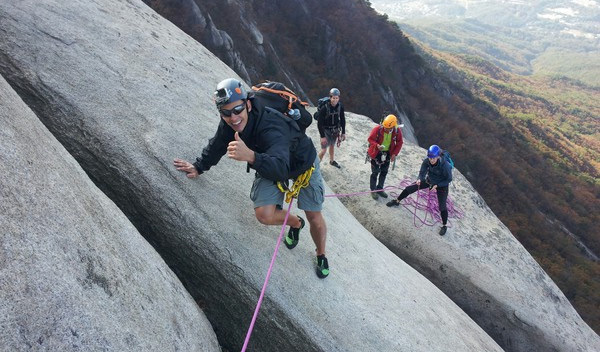 A short 40 minute drive away from the city is Bukhansan National Park, home to one of South Korea’s most famous climbing sites. The mountain has several peaks, but Insubong is the most popular for climbing. It features a granite peak and over 50 routes, a majority of which are slab. The easiest route is a 5.7 and the most difficult is 5.12. Atop the peak you’ll be greeted by staggering views of the surrounding peaks, park, and glimpses of Seoul in the distance. December through March is the best time to go. About three hours west of Tokyo, Mt. Ogawayama makes Japan’s already overwhelming beauty even harder to fathom. This granite rock towers over 2,000 feet high and offers a good mix of crags, slabs and faces that will give you the chance to practice a variety of techniques. There are over ten climbing sections, each with several routes, so there are plenty of opportunities for intermediates scattered throughout the entire park. Because it has a high elevation, it can get very cold at night. Rain is common in this part of the country, but generally the best time to go is between July and September. Dragon’s Cave in English, Long Dong’s sandstone cliffs are right along the northeastern tip of Taiwan. Unlike the other locations on this list, these cliffs provide breathtaking views of the ocean, and are mainly crags. While this makes for an incredible backdrop, the waves and tide of the Pacific may impact the accessibility of some routes. The routes range from 5.7 up to 5.12, with a commendable number in the 5.7 to 5.9 range for intermediates. Climbing can occur all year round, but this part of Taiwan tends to receive a lot of rain. Fall and spring are the most popular climbing seasons.